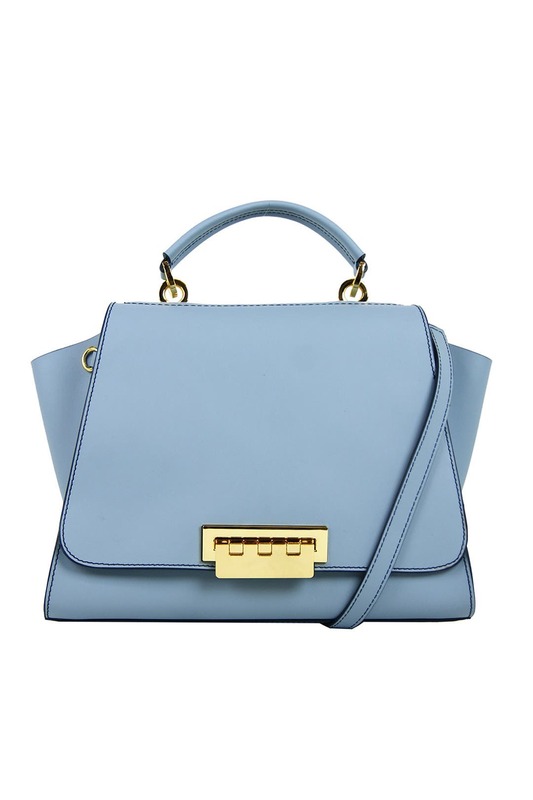 A bright blue adds a playful vibe to this ZAC Zac Posen handbag. Leather and gold accents make this bag feel luxe. 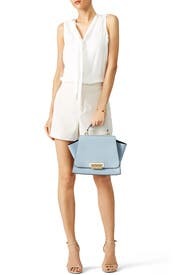 Soft blue calfskin satchel with gold hardware. Flaplock closure and optional shoulder strap with a 19" drop. 11"L x 8.5"H x 6"D.
Goes great with dresses and jeans! 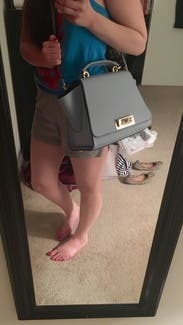 Love the color of this purse ! I loved using this bag for work and everyday activities. The color is beautiful and the quality is impressive. Stunning bag. Favorite from unlimited so far! This bag is gorgeous . Highly structured. Beautiful color. My pic is to show size of bag. Great size for every day. Not a tote, but you can definitely fit all the essentials in there by far. There is a pocket on the outside which is great for putting your phone or keys or work badge in when you know you'll need to grab one of those things. The clasp works great and is secure; I always love bags that actually close! I highly tec omens this bag! Hope my pic helps to show size of the bag! I'm about 5'4". Chic shape and pretty spring blue. I like that is has a greyish undertone so it's not too baby-shower-powder-blue. As others have said, the material is a little more plastic-y than expected. I also was not a huge fan of the metallic printed "Zac by Zac Posen" label on the backside. Overall a fun bag to carry for a week with unlimited but not a closet must-have! Beautiful spring color, but hard to deal with. 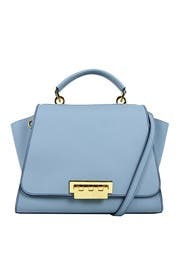 The color of this structured bag is so beautiful, like sky blue! It's almost too structured, I like my bags with a little flexibility. One exterior pocket, which has no give at all, so keys and any device thicker than an iPhone has to go inside the bag. Also only a small slim pocket on the interior. The closure of the bag is awkward. Save this beauty for special occasions only, too much hassle for an every day spring bag. This purse is GORGEOUS! I got a million compliments and I used it from the moment I received it until I had to return it! It is a beautiful color but I have it 4 stars because it's not lined. The pictures obviously show this but it bothered me a little more than I thought it would. It is a little more steel grey blue than powder blue. Functional, light, great color! Love this bag! Love this bag, very classy and elegant. Works well for any occasion. Lots of room inside & not too big or bulky. 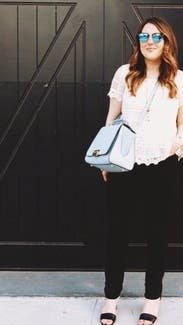 I love a good bag and this one is so cute and fun! I get compliments everywhere I take it. The color is neutral enough to carry with just about anything. This is a great bag. The leather is great quality and has good structure. The strap is long, but not long enough to wear as a cross body. The bag is not a big and roomy as it appears. I got a lot of compliments! 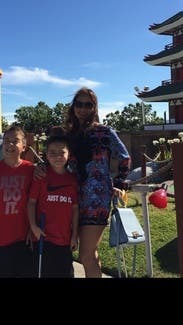 The bag was stylish and went well with the romper in the picture. It has a grayish undertone and the bag can be challenge to open and close. Otherwise it's a very pretty purse. You'll get tons of compliments! Hands down best bag ever! I received as part of my Unlimited subscription and I believe it singlehanded justified my subscription week after week. What can I say...perfect size, shape, 'go-with-everything-color', etc! I didn't want to return this amazing bag -- received compliments everywhere I went. You'll love this bag! I rented this bag in black a few times so knew what I was getting. I love it, the size and shape are perfect and it is surprisingly roomy. I chose the blue this time to match the outfit I had planned, and I think I'll rent some of the other colours in the future. Took this shopping on Rodeo Drive with me. I rented it for the month and have received countless compliments on it! I really liked carrying this bag. It looks like a work of art. 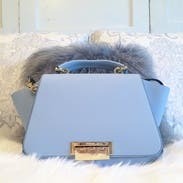 I loved the angles of the bag and the baby blue color. The hardware was gorgeous. My two complaints are the weight of the bag and the closure. The bag is very heavy empty. The front clasps closes the flap, leaving the two wide sides open. I was worried that something like lipstick would fall out. I love this bag! I have gotten so many compliments on it. The leather is so nice and smooth, and it can hold a lot of things in it (besides laptop, not large enough for that). Not many small compartments inside but fits a lot of things in it. I have to say that since childhood I have been drawn to baby blues and periwinkle, so when Pantone announced "Serenity" as one of their 2016 colors, I knew there would be lots of fashion in blue this year. This bag is the perfect shade, and held its shape wonderfully. It is one of the sturdier, more structured bags that RTR has available, so it travels well. I did expect it to be a bit larger, but it held all of my things easily. To see me style other Rent The Runway items, visit my blog at www.themiamirose.com. Smooth, classy exterior! Beautiful bag! This bag was amazing! I am going to look out for Zac Posen after renting this bag. The shape, size, and strap length suited me perfectly. I wore this with a dark colored outfit so the light blue popped! Sharp shape, beautiful color. Great size for everyday. The color is a soft hue of blue, perfect for summer. I am using daily for work, and the bag transitions well to a statement purse in the evening. I am loving it. This bag is truly beautiful. I only give it 4 stars because it makes a lot of noise when carried on the shoulder (because of the buckles). Otherwise, a great design, and the color is beautiful, pale blue. Some say gray, but I see it baby blue really. Amazing bag! Will rent again. While I liked the bag -I didn't get to enjoy it due to the condition. Unfortunately the wear was too much for me to use the bag for Thanksgiving weekend. Beautiful, eye-catching color. Great bag, roomy and fits lots of items. Great for travel as you can slip things in the side. Loved this bag! LOVE THIS BAG! So lightweight and great color! used it for work and play! Had a business trip to Asia where it would be 95+ degrees. Used it for work and for walking around the city. The size is perfect to carry everything and the bag itself is surprisingly lightweight, yet sturdy. 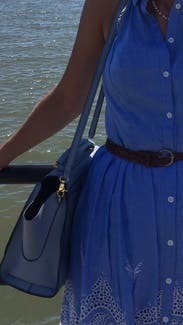 Love this bag and can't wait to rent again for spring and summer. It was a bit rigid for everyday use (I prefer a softer type bag) but I did take it to dinner on several evenings and got lots of compliments. The color is perfect for the spring/summer months and it compliments and really completes the outfit! I will probably rent this again. Nice spring bag - though maybe not for every day. Great color, though I found it heavy. Also, it is quite cumbersome to have to flip open the clasp when digging for keys/wallets. i'm a black bag kinda girl.... granted i like unique black bags... but i'm a sucker for a classic go-with-everything back handbag.... therefore i really stepped out of my comfort zone with this blue zac posen. but since i knew it wasn't a permanent decision i decided to give it a whirl. and i'm so glad i did! it's the perfect medium size and goes with nearly everything... from athletic wear to dinner attire. easy to get in and out of too. It's a great bag. I love the backside pocket for holding a phone. I was expecting a nicer quality leather from a Zac Posen bag, this one seemed a bit plastic-y. The bag I received also had scratches on the metal piece on the front. Clean design, functional, easy to use, and so fine! 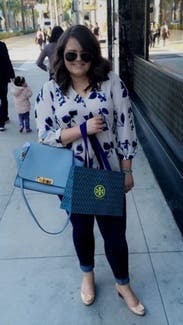 I received a lot of compliments while carrying this Zac Posen bag! It's a soft powder blue-grey with a latch closure. The bag is quite roomy and I was able to more than fit all my items comfortably without stretching and distorting the bags form. I was able to fit my Hobo Lauren wallet, kindle, makeup bag, key pouch, phone, and earbuds comfortably. There is a flap pocket located in the bag and a pocket located on the back of the bag (both comfortably fit an iphone 6s). I traveled with this bag and it felt very safe and secure. It can be worn across the shoulder or carried by the handle with ease. This bag is not heavy at all and was quite comfortable and easy to access. There were only marks on the leather where the metal hardware had worn (I was able to remove those with a soft dry cloth) and the metal closure was a bit nicked and scratched but the leather to the bag was almost flawless. Nice color and style. Dressed up my everyday clothes. Took this along on a trip to Vail. Great size, beautiful color, classy style. The clasp that closes the purse is slightly annoying to open and close. I received so many compliments on this, especially the color. The size is perfect for everyday use. My only complaint is that it's kind of a hassle to close the clasp each time and the gold scratches easily.